If Bhante Pn Wa Ra still lived in the country of his birth, he would not be able to practise his religious beliefs without fear of retribution. He might also not be alive today to tell his story. Nearly 18 years ago, Bhante (pictured) left his home country, Myanmar, in fear of being arrested and tortured – and possibly killed – simply because he chose to make a stand for peace and justice. Although Bhante came to Australia to improve his English communication skills, the reason he chose Australia over other English-speaking countries is because of our reputation for being a peaceful nation. Bhante’s true calling is to study what it means to live in peace. Friday June 20 is World Refugee Day and Australia’s theme of “A Place to Call Home” encourages people to think about the global themes of protection and human rights by focusing on the fundamental right to a secure place to call home. 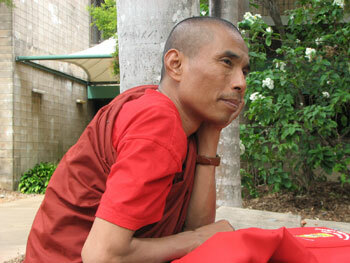 Bhante Pn Wa Ra was born 48 years ago in a small village in Central Burma. As a young boy he became a novice monk and went to live in a monastery in Mandalay, 100 kilometres south, to study Pali language and the way of the Buddha. After the military coup in 1988, and the killing of two monks in a peaceful demonstration, Buddhist monks throughout Myanmar vowed to refuse donations of food or money from the military rulers as a form of protest. Buddhism recommends its followers donate to monks as a mark of their religious devotion. The monks’ refusal to accept donations from their military governors was a form of religious excommunication that provoked their wrath. To protect themselves, Burmese monks established a union, and under their slogan, “Peace and Justice”, they remained steadfast. But in 1991, the military regime reacted against the Buddhist ruling, and 3000 soldiers raided Bhante’s monastery in Mandalay and attacked the 315 monks living there. They beat and brutalised them, and arrested several monks and dragged them away for questioning. One monk was falsely accused of being a union leader, and under torture he gave up Bhante’s name as a union activist. When Bhante heard that the soldiers were about to arrest him, he fled to the Indian border, travelling by foot, by car and by boat, in the hope of reaching asylum. For five days and nights he was on the move, sleeping on the side of the road to avoid being informed on by military sympathisers. When he eventually arrived at the Indian border he was told he had to go to Dehli to apply for political asylum. He didn’t have any money for the journey, so he hitched a ride to where paid work was available. Bhante got a job in a sweatshop weaving sarongs for a pitiful wage, but contracted malaria and became seriously ill. He continued to work every day, however, desperately trying to save enough money to get to Dehli. Because of his illegal status, his employer took advantage of him and paid him a fraction of what he was due. It took Bhante six months of working 12-hour days in damp, dark conditions to save enough money for the train ticket to Dehli, where he was issued with permanent refugee status the next day. For 18 years, Bhante lived in Dehli, with a Burmese family who he had known in Myanmar before the military dictators forced them all to flee their homeland. He took English lessons from an Australian woman, who told him about Australia’s multicultural society and inspired him to dream of living in Australia one day. Although Bhante was deeply affected by the sight of his friends killed in front of him, shot down in cold blood less than a metre from where he stood, he wants to return to the country of his birth and face those memories again one day. But in the meantime, he is content to live in harmony with people of different views and beliefs, and fulfil his dream of calling a peaceful, just and free nation his home. Bhante attends English classes held at Charles Darwin University (CDU) by the Adult Migrant English Program (AMEP). The AMEP is funded by the Department of Immigration and Citizenship, and delivers free English classes to more than 400 migrants and refugees each year from countries such as Thailand, Indonesia, Sudan, Somalia, Liberia, Congo, Burundi and Myanmar. Classes are held at CDU campuses in Casuarina, Palmerston and Alice Springs, as well as at Nhulunbuy, Katherine and Jabiru. The United Nations agency for refugees has set aside June 20 each year as World Refugee Day, a day of observance for millions of refugees around the world. The theme of Australia’s Refugee Week, “A Place to Call Home”, encourages Australians to think about our common obligations to people who have no secure home, as well as to acknowledge the 700,000 refugees and humanitarian migrants over the past 60 years who have made Australia their home. World Refugee Week will be held in Darwin from Sunday, June 15, culminating with an event in Malak, at Holzerland Park on Saturday, June 21. The event will include citizenship ceremonies, cultural performances, food tasting, film screening, awareness raising and solidarity. For more information, contact Nic Borgese, from the Melaleuca Refugee Centre, on: 08 8985 3311 or email: nic.borgese@melaleuca.org.au.